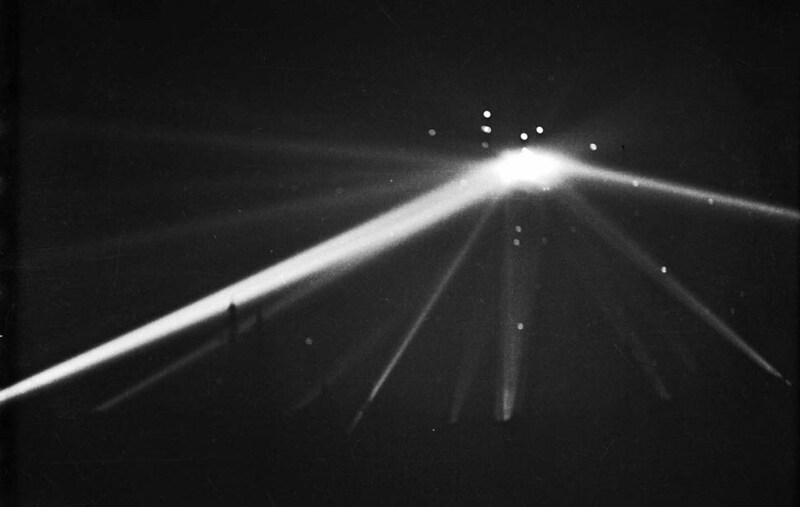 On February 25th, 1942 at 2:15 am radar detected an object flying 120 miles off the coast of Los Angeles. 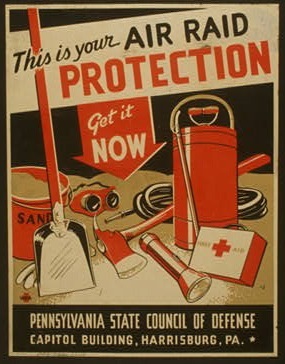 Air raid sirens began five minutes later and a blackout of the entire city was ordered at 2:25 am with much of the coast going dark all the way down to the Mexican border. 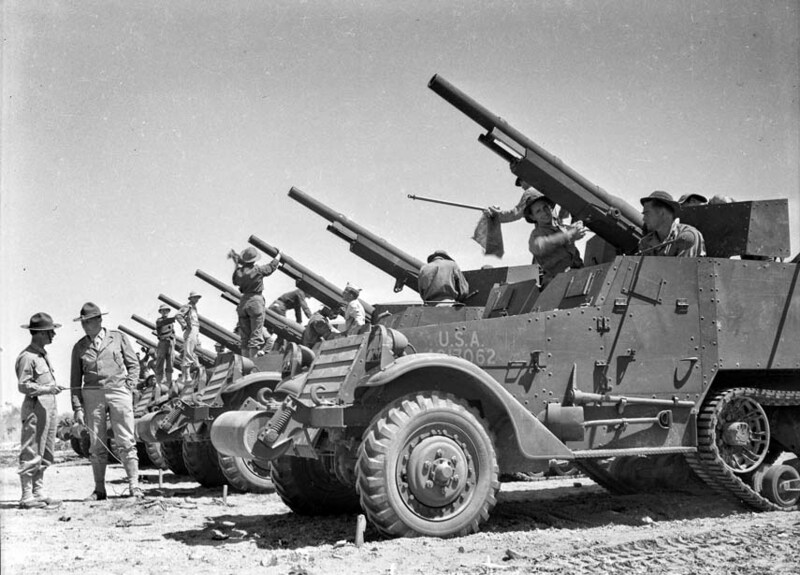 Anti-aircraft guns were placed on alert and were ready to fire at a moment's notice. World War II had finally come to Los Angeles. 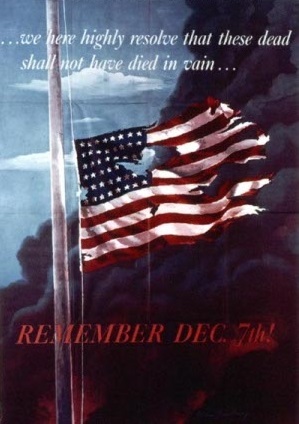 In the morning of December 7th, 1941, the Imperial Japanese Navy attacked Pearl Harbor leading to the deaths of 2,402 Americans along with massive damages to the United States Naval fleet. With Japan's brutal and surprise attack on the United States, America entered World War II. Paranoia on the west coast began immediately. The event in Hawaii was so traumatic to the citizens of California, that the question wasn't if an attack from Japan would come, but when and where the attack would occur. Hysteria started the day right after the attack on Pearl Harbor as rumors spread of a Japanese aircraft carrier cruising off the coast of the Bay Area. The city of Oakland closed their schools and later in the day a blackout was issued, sirens provided from police cars blared through the area, and radio silence was ordered. No attack came, and there was no Japanese aircraft carrier off the coast, but paranoia along the coast set in regardless. As Japanese submarines began to attack merchant ships off of California's coast, citizens of the state came up with one outlandish rumor after another about the eventual invasion. Secret Japanese air fields were said to exist hidden away in the California deserts. German spy rings existed in every town, and the Axis powers had assembled an attack force in Mexico or in South America just ready to strike! And right in the middle of it all were the Japanese American citizens who lived in California. According to the rumors, every person of Japanese descent was ready to rise up and join the invasion force. Of course none of this was true, but it led to an atmosphere of fear, paranoia, and distrust. 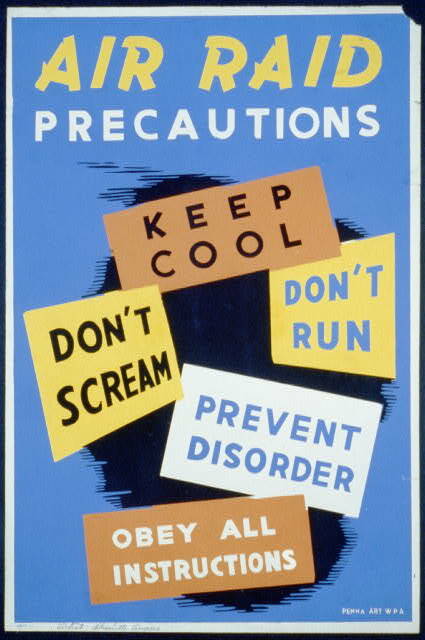 Anti-aircraft guns were set up, bunkers built, air raid precautions were drilled into the populace. 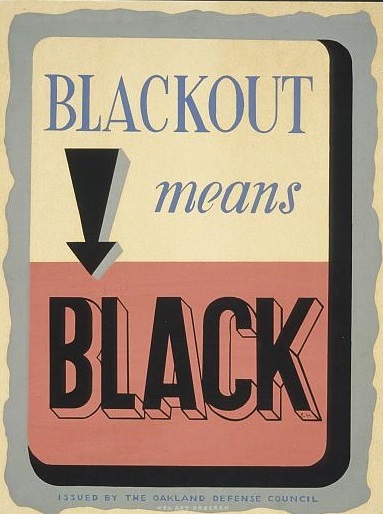 Blackouts such as the one in Oakland became more prevalent. Tourism to Catalina Island was completely halted and Terminal Island in Los Angeles Harbor was placed under martial law on December 8th, 1941. Terminal Island housed a U.S. Naval base, several major oil installations and a large community of Japanese fishermen. The military was apprehensive of the Japanese community and immediately declared martial law on the island. Soon after, on February 1st, 1942, they rounded up all the male fishermen and sent them off to Fort Lincoln, Nebraska. When the relocation camps were later ready, the rest of their families were also removed from the island. 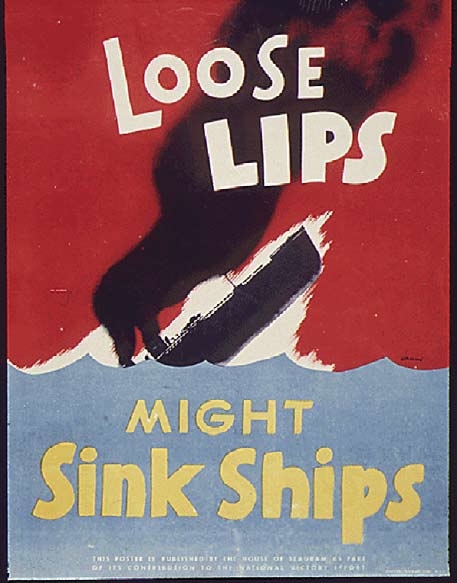 Several merchant ships were attacked by Japanese submarines in the coastal waters of California especially during the last half of the month of December 1941. 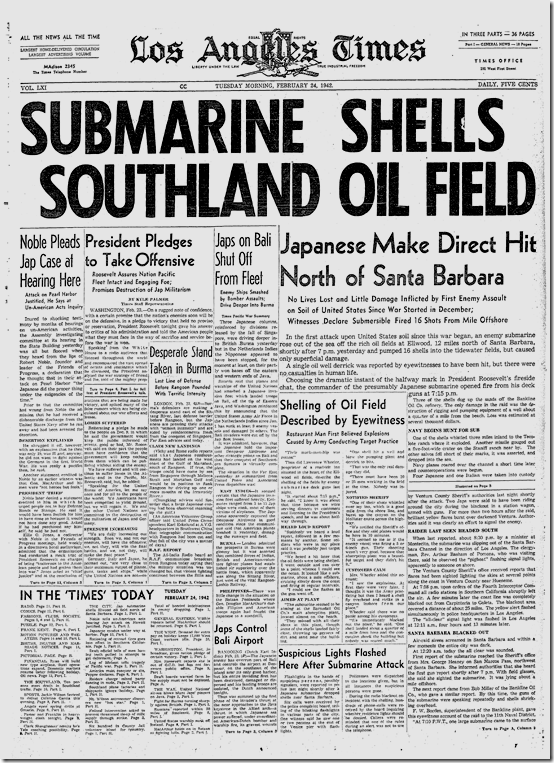 As paranoia continued to mount, on February 23rd, 1942 at 7:15 pm during President Roosevelt's Fireside Chat, the Japanese submarine, I-17, surfaced near Santa Barbara and shelled Ellwood Oil field in Goleta. Although damage was minimal, only $500 in property damage and luckily no one was injured, the attack had lasting consequences as the citizens of California believed that the Japanese going to storm their beaches at any minute. 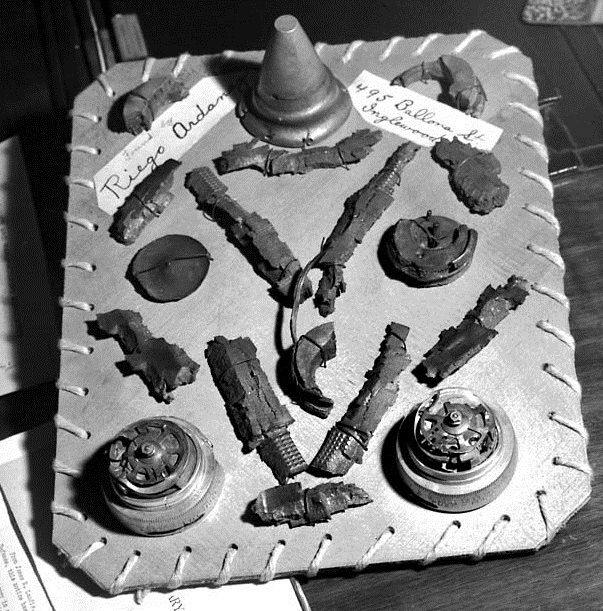 Less than two days later, on February 25th, 1942 at 2:15 am radar detected an object flying 120 miles off the coast of Los Angeles. Air raid sirens began five minutes later and a blackout of the entire city was ordered at 2:25 am with much of the coast going dark all the way down to the Mexican border. Anti aircraft guns were placed on alert and were ready to fire at a moment's notice. Suddenly radar contact was lost, and search lights sprung up all over the coast searching the skies. 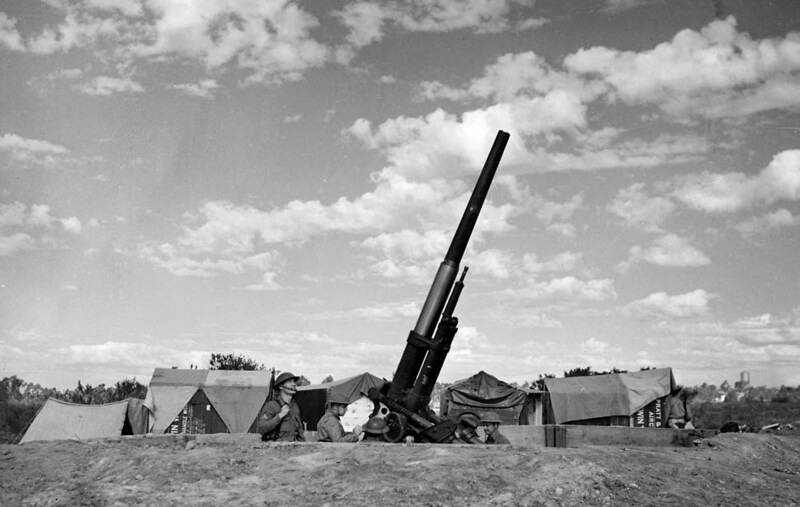 At 3:16 am, shots were fired into the night sky as the 37th Coast Artillery Brigade began firing both anti aircraft shells and .50 caliber machine guns up into the sky. Defensive batteries in Inglewood, Santa Monica, and other locations in Los Angeles all opened up to fire upon something in the sky. Artillery fire continued until 4:14 am and the all clear along with the lifting of the blackout finally happened at 7:21 am. But what did they fire upon? 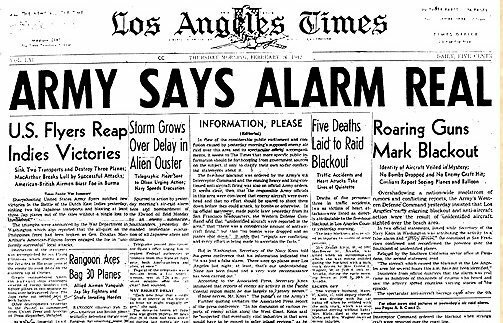 The entire incident is now referred to as the "Battle of Los Angeles" or the "Great Los Angeles Air Raid". No bombs were dropped on Los Angeles and no planes were shot down by the shells and anti-aircraft fire launched into the air. 1,440 rounds of ammunition had been shot up into the sky that night. Although many people believed they had seen something, and in some cases "something" ranged from blimps to hundreds of Japanese planes, no one could settle upon what had actually been up in the night sky, let alone produce any evidence that there had indeed been something up there. Some people, particularly the U.S. Office of Air Force History in 1983, blamed "war nerves" probably caused by the sighting of a lost weather balloon. Blame was also placed on a transformer blowing up accidentally at the San Pedro Water and Power which caused the sirens to go off and the gun batteries to "return fire". Although there were some higher ups in the military and government who swore that there were enemy planes overhead that night, most military officials concluded that the entire incident had been one large false alarm. Those who stuck to the enemy planes in the skies theory believed that the planes originated either from secret air fields in the California desert or perhaps Mexico or were light weight planes launched from an off shore Japanese submarine. Light weight planes launched by submarines did in fact exist and the Japanese utilized them in a couple of situations later in the war, for example during a failed attempt to bomb Brookings, Oregon. Property damage from falling shell fragments was significant, and sadly five civilians died during the night. Two suffered from heart attacks and three were killed in car accidents. After the war, Japan revealed that they had not attacked Los Angeles that night, nor did they even have any ships or planes near California at the time. They had had plans to invade Los Angeles and were within hours of enacting it on Christmas 1941, but had changed their plans shortly before hand and never gone through with it. The entire incident, combined with the actual shelling of Goleta less than two days earlier, showed just how fragile residents in California were during World War II. As paranoia increased, and demands mounted from then Mayor of Los Angeles Fletcher Bowron, Washington DC gave into the pressure and enacted Executive Order 9102 on March 18th, 1842. This sadly led to the establishment of WRA Relocation Centers and the internment of over 110,000 people of Japanese heritage. Two such War Relocation Authority centers were established in California, one in Manzanar and one in Tule Lake. The internment lasted all the way until January 2nd, 1945 when the order was rescinded, allowing those interned within the freedom to return home. But was there something in the sky that night? Countless eye witnesses thought so. Some say it was several planes. Others thought it was a blimp or something similar like a weather balloon or one of the Japanese fire balloons. But years later near the end of the 1940s the new theory was that it was an alien space ship! The story states that a large disk shaped object slowly made its way from Culver City over Santa Monica and finally past Long Beach where it disappeared. Some stories also add that there was a group of silvery objects in the sky over head in Culver City. 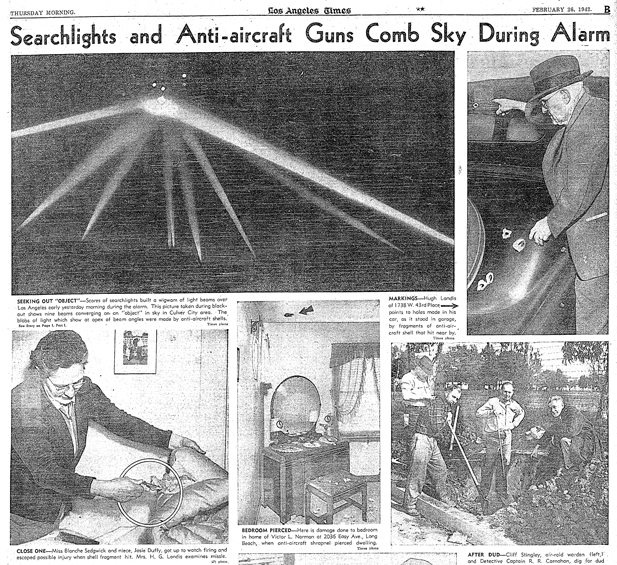 The stories continue that the searchlights and gun batteries targeted a huge alien spacecraft hovering over the Los Angeles area and that hundreds of rounds hit the target, but no damage was done to it. The basis for much of the UFO speculation originates from a photo published in the Los Angeles Times that modern day UFOlogists claim is evidence that a UFO or alien space craft flew over Los Angeles that night, and was fired upon, without any affect, by U.S. military. 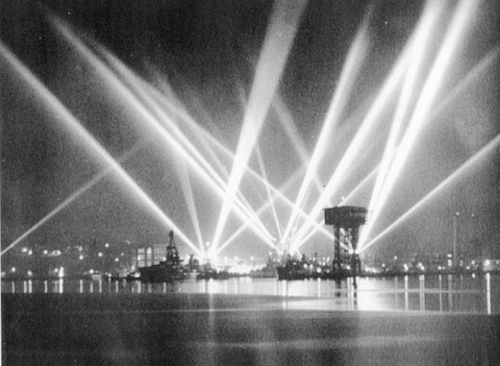 In the picture, the searchlights do appear to be focused on a strange blob like object illuminated in the middle of the lights. But the photo in question was heavily retouched, a common practice by newspapers at the time in order to help with the contrast of the photo. 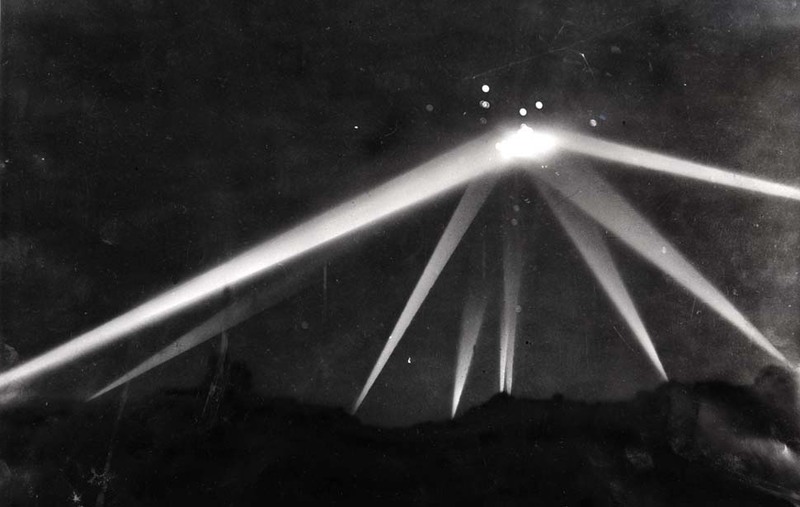 The searchlights in the picture had white paint used on them in order to lighten them, while the bottom part of the image was painted black. The blob in the middle of the searchlights in the original un-retouched picture is much less pronounced as it is in the retouched version. But, of course, there are multiple eye witness statements that discuss the object in the sky that night. The most famous of the statements is by a woman known only as Katie who lived in Santa Monica. She has never had her last name identified in any of the works discussing the incident. She claimed to see an enormous pale orange object hovering over her house. She also claimed that the military sent fighter planes up after it. A claim that has been completely denied by the U.S. military, as reports issued state that no U.S. planes were launched into the air that night. Other more credible eye witnesses also had "seen" things making the events of the night hard to figure out. For example, the Chief of Police of Long Beach, J. H. McClelland was up on the roof of the Long Beach Civic Center and claimed to witness planes coming inbound towards Redondo Beach. Peter Jenkins, a staff reporter from the Herald Examiner reported that he could clearly see a "V" formation of about 25 silvery planes flying slowly towards Long Beach. So what did happen that night? Was there a giant UFO hovering over Los Angeles that night? Or was there sinister Japanese forces flying through the dark skies? Or was it a blown transformer at a nearby power plant? Or was it some nickle balloons used to test local radar sites? Or was it more likely just simply a false alarm, a big case of "war nerves" set off by a military and a population that was understandably at the limits of their paranoia and hysteria? Lastly once a year around the anniversary of the event the Fort Mac Arthur puts on a special recreation of the events of the night. For more information on the Bombing of Ellwood, Japanese Fire Balloons, or the attack on Brookings, Oregon, please see The Attack on Goleta.